Mark Paul has consulted for numerous companies in various industries. He held senior executive positions at a Global 500 company as well as interim executive leadership roles for start-ups and a public company. His main focus is in getting results for clients (i.e. acquiring customers, increasing revenue, building company value, increasing cash position, reducing costs and improving productivity). Assignments are typically focused on customer-attraction, although they may also address leadership or strategic issues, program / project management, time-to-market problems or other business development / operational / marketing issues, which significantly enhance competitiveness / boost corporate valuation, for companies with both domestic & international market presence. leading a major business unit from inception to eight-digit revenue in 2 years. - Top 2% of Global 500 corporation. over $8 million in profits in two-years. - Northrop intrapreneur, responsible for developing & vetting ventures. - Led / developed proposals that generated over $500 million in grants ond revenue. - High-tech start-ups: Developed business plans, built Boards of Directors and found funding. - Improved time to market delivery, generating five times expected revenue ($25 million) in 2 years. - Transformed company to a profit-generating web-enabled e-business, in 1996. - Embedded software company: improved profits > 50% to $1 million. 3 months. -Positioned and helped companies raise over $46 million through investments and acquisition. - Worked with over 100 client organizations, large & small: several industries. - Interim COO: Full P&L responsibility; Increased company operating cash from $150K to $1.4 million (30% of gross revenue) and increased revenue over 60% within two years. Stock increased 3.8x during 18 months  now worth 15x due to profit generation, while entering e-commerce space. Responsible for Marketing, Sales, Engineering, Finance, Production, Product & Project Management. Implemented organizational and process improvements, resulting in companys 34% growth while developing eight new products in 18 months. (Product Development Roundtable case study). Product selected for Pacific NW Software Qualitys 1998 Software Excellence Award as a direct result of process and organizational improvements. - Reduced product development cycle from 24 to 14 months, saving over $2 million annually. Stock increased from $3/share to over $12/share. 14 months. Interim executive work: CEO, President, COO, VP of Marketing & Sales. - Interim CMO: Direct marketing response rates increased from under 2% to nearly 9%. Circulation increased 147%. Customer acquisition costs dropped 62%. First year value increased $242,000. Lifetime value of additional customers increased over $6 million. - Increased acquisition value of "25-year old start-up" 20x in 6 months, due to strategic advice and interim executive work in marketing, sales, operations and project management: from prior offers of $1 million, to $20 million. - Owned marketing strategies / tactics, marcom, PR, web site administration, and tradeshows & other events: Obtained direct mail response rates of 25%. Saved six months on a two-year project, which resulted in over $4.5 million revenue in five years. - Led a team of over 50 people on a complex software-controlled electro-optical "skunk-works" project, reducing delivery schedule from 18 months to 5-1/2 months. - Chief Operating Officer, Chrome Data Corporation Software for Automotive Industry. Entrepreneur/Executive-in-Residence at Oregon's Technology Incubator. Provide advice and council to several companies. Developed incubator's Acceptance Process & Criteria, Quarterly Progress Review Process, and Graduation Policy & Guidelines. International business development: Asia & Europe. Built Board of Directors to position a company (and located) first round financing. Board member for start-ups. Board of Advisors, several technology companies. "How to Attract Significantly More Customers" (book). "The Entrepreneurs Survival Guide" (book), for business leaders taking their companies to their next level. Based on "Leading Your Company: Real Solutions" - monthly "how-to" articles syndicated in several publications across the United States. Audio presentation: "How Entrepreneur's Can Survive & Thrive in Challenging Times". Published articles on leadership effectiveness: Advanced Management Techniques in Florence, Italy, The Business Journal, The Times, Oregon Business Magazine, Automotive News, Chevy Preview, Software Development Forum and other publications. "The 21st Century Energy Initiative: How to solve our energy problems. "Renewable Energy Blog. Guest lecturer: University of Phoenix (MBA capstone project), Portland State University (MBA, e-Marketing course & Lab2Market series), North Hertfordshire College, England (Internet Distribution), Oregon State University (Capstone Ag-Business course). Keynote Speaker for University of Portlands Entrepreneurs Challenge & Lab2Market. Guest speaker at functions sponsored by: Oregon Entrepreneurs Forum/Network, Software Association of Oregon, American Electronics Association (AEA), American Marketing Association, Society for Technical Communication, Small Business Development Center, Electronics Manufacturing Association, Project Management Institute, and Northcon. Invited guest, KBNP radio, DreamBuilders TV. Board-level & Military Chief of Staff presentations. Built business in Asian and European markets. Selected to join Governor Kitzhabers international trade mission to England. Selected by Oregon Business Magazine as Management Advisory Panel member. Founder and Chairman of the Software Association of Oregons Product Development Special Interest Group. Founding member, AEAs Competitiveness Groups TQM Partnership for Competitiveness. Supported the Project Management Institute and the American Society for Training and Development in various roles. Case Study #1 for the AEAs Innovation NOW Conference. Selected as finalists for the PNWSQCs Software Excellence Award. On Oregon Entrepreneurs Forum/Network Start-up Services Committee, which helped hundreds companies improve their businesses. Presidents Council for the American Marketing Association. Elected GP of troubled operations  able to return $640,000 (100%) of investors fund. Hydrogen-production client (2003). Primary research into the renewable energy "industry" & technologies (2003-). On the board of a bio-diesel company (2002). Support of Oregon Environmental Council (2008-). Efforts to develop Renewable Energy Technology Accelerator (2007-). Software-controlled electro-optical sensor device: Patent # 4,631,583. 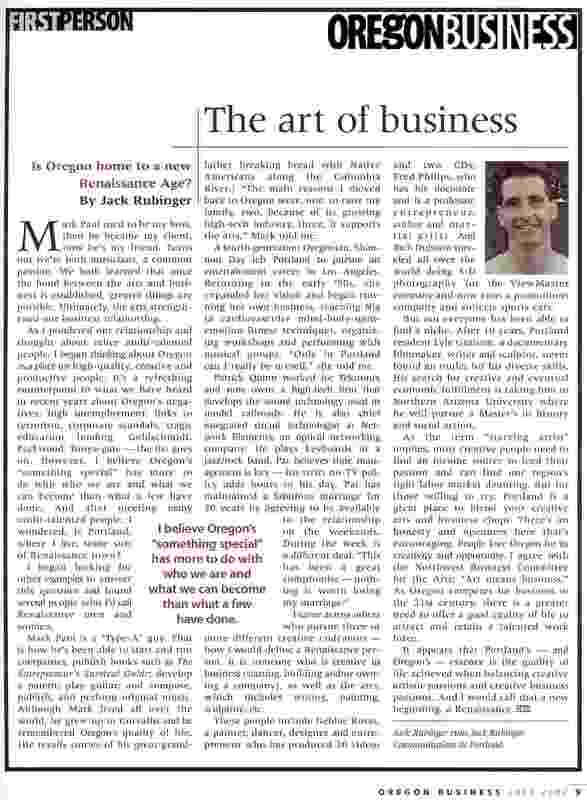 Identified as a "Renaissance Man" in Oregon Business Magazine. Played various instruments in various bands over the years. Produced several CDs. Last band (1997 - 2004): aphasia. Bachelor's in Physics, University of California, Irvine - 1978. Courses/classes/lectures by Frederick Reines, Gregory Benford, Joseph Weber and Richard Feynman. Post-graduate studies: Cal-Tech & Cal State Fullerton. Extensive leadership training, including through Senn-Delaney. "Mark is an inspiration to the networking world. His vast background lends to his ability to adapt to others needs and assist them in improvements. Being a fellow author it is apparent that Mark cares for his fellow business associates."  Cleon Cox III (Business owner, author). Value: An experienced executive who can help you immediately and to help you achieve your long term objectives.